I'm really not much of a movie buff, spending most of my time at live theater. I've never seen the 1950 classic movie Sunset Boulevard, about a delusional aging Hollywood star and the younger screenwriter whom she takes as her lover while he helps her edit her screenplay that she believes will be her comeback. The movie was turned into a musical by Andrew Lloyd Webber and opened in 1993 in London, with by a Los Angeles premiere later that year, and Broadway the following year. The three productions starred, at various times, such legendary actors as Patti LuPone, Betty Buckley, Glenn Close, Elaine Page, and Rita Moreno. Minneapolis Musical Theatre has taken this big lavish production and stripped it down to fit on the small stage at New Century. But the story still remains big, and Sarah Gibson as Norma Desmond does an incredible job filling the shoes of the women mentioned above. I'm not the biggest Andrew Lloyd Webber fan (as they say in Xanadu, "so grand and so earnest but ultimately so preposterous that one has to laugh"), and this show is very Andrew Lloyd Webber. But if there's one reason to see this show it's Sarah's delightfully exaggerated and completely committed performance as this complex, manipulative, crazy, and somehow sympathetic woman. If you're one of the two other people on the planet who have never seen the movie, here's a brief plot summary. Circa 1950, struggling writer Joe Gillis ends up at the grand estate belonging to silent film star Norma Desmond when his car breaks down. She lives there alone with her butler (and ex-husband) Max. When she finds out that Joe is a screenwriter, she shows him the screenplay that she has written, and convinces him to help her get it into shape to submit to the great movie-maker Cecil DeMille. It's awful, but Joe does his best. He moves in with her and she showers him with gifts, and they eventually become lovers ("I get suits, and she gets hope"). Norma is a master manipulator; she has Max wrapped around her little finger, and all it takes is a little uncontrollable weeping or a suicide attempt to get what she wants out of Joe. She sends DeMille her screenplay and goes back to the studio where she was once a fixture, and prepares to make her comeback, unaware that everyone's laughing behind her back. Meanwhile, Joe has been working with a young screenwriter named Betty to adapt one of his stories. Although she's engaged to be married, the two fall in love, until Norma calls Betty to tell her where and how Joe has been living. Disillusioned, Joe tells Norma that her comeback is a joke, and plans to leave Hollywood for good. But Norma is not about to let that happen. Like many Webber shows, the musical is mostly sung-through; there's little spoken dialogue. It reminds me a little of Evita, with similar musical sounds and plot structure, with Joe serving as a narrator as well as a character in the story. I didn't think I knew the score, but the song "With One Look" is familiar to me, and of course I know "As If We Never Said Good-Bye" from that episode of Glee in which Kurt sings it. Both songs are beautifully delivered by Sarah. I've seen her in several shows in the past (most recently in a supporting role in Theater Latte Da's Light in the Piazza) and have always been impressed by her, but this is a star-making performance. First of all, she looks like a movie star out of old Hollywood (maybe because I've only seen her in period roles). In this show, her every gesture, every word (I particularly like how she enunciates "picture"), every movement, every cell of her body down to her little finger, is imbued with Norma Desmond-ness. In heavy eye make-up and red lipstick, wearing feathers and fur, animal prints, flowy sleeves, headwraps, and jewels, she plays the role to the hilt. But if Norma is the star of the show, Joe is our tour guide through this weird world. Tim Kuehl (who looks like Vince Gill and sings almost as sweet) ably carries the show from Norma's creepy world to the world of young Hollywood, representing the audience as a bit of an outsider in both. His version of the title song, somewhat desperate and sarcastic, is another highlight. The lovely-voiced Aly Westberg is charming as the bright young writer Joe falls in love with, as they sing a sweet duet "Too Much in Love to Care." There are also several nice group numbers performed by the capable ensemble. An interesting feature of this production is the use of video. Screens on either side of the wide and shallow stage show still shots of Norma's house or the studio lot, adding to the sparse set decoration to set the scene. Oftentimes an onstage camera tracks Norma's movements and displays them on the screen. The shaky close-ups, on which Sarah's wide-open eyes are even more apparent, ramp up the creepiness of the story. Nice period costumes on everyone, but Norma's get-ups are obviously the standout (costumes by Rian Berberich). Last but not least, a shout-out to the great slightly-off-stage band (directed by Lori Maxwell). This is only my second MMT production (the other being Gilligan's Island: The Musical, which couldn't be more different from Sunset Boulevard), and so far I like what I've seen (and I'm super excited about their summer show next year - the brilliant political satire Bloody Bloody Andrew Jackson!). 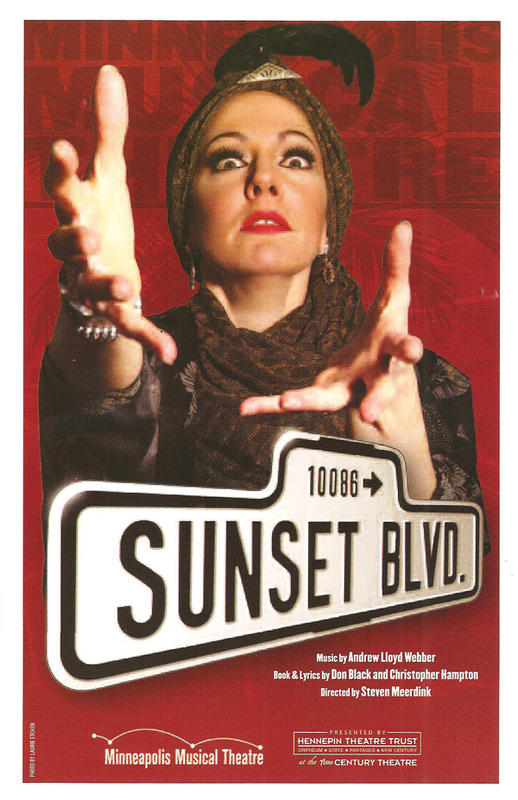 Sunset Boulevard is a co-production with Hennepin Theatre Trust, and plays now through June 23.